Sheff jumps back on the carousel, lives to tell about it. What would it be like to have written a drug memoir and an autobiography before you turned 30? Would it seem like the end or the beginning? Are there any worlds left to conquer? The last decade has brought us fleshed-out young examples by Augusten Burroughs, age 37 (Dry); Joshua Lyons, 35 (Pill Head); and Benoit Denizet-Lewis, 33 (America Anonymous). This more or less fits the pattern established by the doyenne of the genre, Elizabeth Wurtzel, who, at age 35, wrote the addiction memoir More, Now, Again. 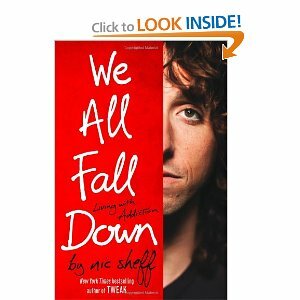 And now along comes Nic Sheff to put them all to shame, making geezers out of every one of them. Sheff wrote Tweak at 24, telling the world about addiction and how he’d conquered it. Well, as it turns out, not really. But for twenty-somethings, a week is like a year, so two years later, in actual time, comes We All Fall Down, in which we learn—if we didn’t learn it the first time—that the author is still learning about addiction, doesn’t have it figured, and isn’t really qualified to give out lessons to anybody just yet. Or perhaps I should wait for We All Stood Up Again two years from now before drawing any conclusions. I know I am being a bit unfair to this well-intentioned young author. I blame it on the flood of weighty pronouncements found in the addiction memoirs that have flooded the market lately. God bless ‘em all, but Amazon, by listing Sheff’s book as “Young Adult,” probably gets it about right. You can’t go into these projects expecting great literature. Sheff’s text, perhaps in a deliberate appeal to younger readers, is peppered with whatevers, and clauses that begin with “like.” His favorite adjective, without question, is “super.” Too many one-sentence paragraphs give the book an irritatingly staccato effect at times. But let’s get beyond that. There are good things here, and Sheff is certainly qualified to tell an addiction story: “We stayed locked in our apartment. I went into convulsions shooting cocaine. My arm swelled up with an abscess the size of a baseball. My body stopped producing stool, so I had to reach up inside with a gloved hand and….” And so forth. So Sheff plays along, he shucks, he jives, he lies, and it’s hard not to sympathize with him as he summarizes one counselor’s admonitions: “We don’t allow any non-twelve-step-related reading material, and you won’t be able to play that guitar you brought with you—so we’ll go ahead and keep that locked in the office.” Much like prisoners who leave prison chomping at the bit to commit new and more lucrative crimes, these kids are coming out of misguided drug rehab centers with nothing but an urgent desire to wipe away the bad memories of mandatory treatment by getting wasted as soon as possible. Maybe there won’t be a need for a third memoir. The book has a provisionally happy ending. Sheff found the right doctor, got on the right medications after a diagnosis of Bipolar Disorder (comorbidity, the elephant in the rehab room), and, when last seen, is clean and optimistic. I loved your review of Nic and his escapades. I couldn't have written it better if I tried. I feel the same way and wondered what the newest update was on the young man. When I read his Dad's book years ago "Beautiful Boy" it was at the same time as I was writing mine. It gave me great incentive to finish mine because I was offering some kind of proactive plan for families, where the senior Mr Scheff was suggesting as much therapy as people could afford. 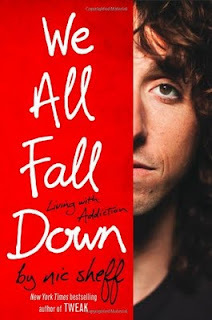 It didn't surprise me that the son would write a book too, but when I saw them both on Oprah, I could tell from my own experience with my son, that sobriety was possibly not a permanent thing with this young man. (Not that it isn't the same for everyone) Mother's intuition, I guess. Thanks for writing about this. I thought I was the only one who thought this way about this subject.